Another of the giant carcharadontosaurs from South America. I believe they have parts of 7 individuals. The most likely explanation is that it lived in some sort of pack. Related to Giganatosaurus, this animal preyed upon the giant sauropod Argentinosaurus. Once considered a relative to Acrocanthosaurus, it's now thought to be an allosaur. Found in England, it was hanging around in the early Cretaceous with animals like Iguanadon and Baryonyx. This is the earliest confirmed carcharadontosaur. Eocarcharia, was found in the same area and strata as the last post's Kryptops. Interestingly these theropods also lived along side of Suchomimus. This seems to be the theme for Gondwana in the Cretaceous, 3 giant theropods as the top predators. I'll have to respectfully disagree. It does seem obvious that they died in the same place, but why would a group of large carnivors of different sizes all died in the exact same place? I know it's considered speculation, but really it seems a fairly obviuous assumption to me. If a groupd of mammalian carnovors were found together, and not associated with a predator trap, a group or pack dynamic would be the most logical conclusion. It makes more sense to me, that the Allosaur/Carcharadontosaur line specilized in the large sauropods and to hunt them effectively they lived in groups, like wolves or lions. From what I've read (and watched, I saw a talk by Dr. Coria years ago) there is only the theropods. Isn't a predator trap usually started by a prey item? I find it odd that they would all die in the same area around the same time and it's only predators. Wouldn't they have spread out a bit and possibly hid from other predators as oppossed to all dying in the same area? I have dogs, and a sick dog will go off on it own by itself. I know other predators will also do this, including reptiles, so why would a dying theropods group together? THAT seems quite odd to me. A trap that only has predators... has one like that ever been found? And then why only the same speices? I would expect to see some abelisaur remains, or at the very least, some small theropods remains. It could have been a big fight but wouldn't the smaller ones have run away? Why would all these predators territories overlap and they all happened to be there at the same time? Sorry, I've corrected some sentences (I apologize for my not perfect english). "If a groupd of mammalian carnovors were found together, and not associated with a predator trap, a group or pack dynamic would be the most logical conclusion." These are not mammals. Reptiles and birds often aggregate regardless of cooperation, so it could be also for Mapusaurus. "the Allosaur/Carcharadontosaur line specilized in the large sauropods". There are not direct evidence that allosaurids hunted large (adult) sauropods, nor they hunted in pack. Remember that a juvenile sauropod is a easier and more common pray than an adult: it is not necessary for a single allosaur to kill am adult: there were tens of juvenile sauropods for every adult! Why juvenile sauropods are so rare? We find many eggs and adults, but almost no juveniles? Probably, because most of them were killed and eated by allosaurids, and the few survivors became the relatively fewer, giant (and now invincible) adults. "Isn't a predator trap usually started by a prey item?" 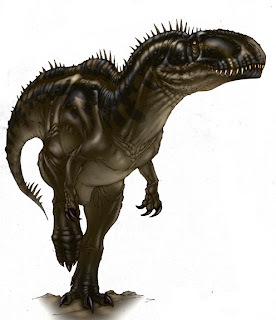 Yes: why not a Mapusaurus? Cannibalism is a very common behavious among carnivorous raptiles and birds: imagine that the 1st animal in the trap was a Mapusaurus, you clearly explain the fossil association. If Mapusaurus was the top predator of its ecosystem (that means, it could be hunted only by other Mapusaurus), tha absence of other predators in the site is clearly explained. "so why would a dying theropods group together? THAT seems quite odd to me." You have not to imagine that they died in the same moment. Once the first predator died in the trap, its body became the bait for the following Mapusaurus, and so on... A similar process may persist over several weeks before the natural trap stops to be active. "A trap that only has predators... has one like that ever been found? And then why only the same speices?" Coelophysis's, Allosaurus's, Albertosaurus's similar bonebeds are known. In my opinion, an aggregation of theropods does not mean unambiguosly that they were part of a pack. If you find 10 crocodyles bodies, died together at the bottom of a drying river, do you automatically interpret them as a pack? It is not the most simple interpretation of the evidence, but a speculation derived by the weak assumption (= lacking evidences ) that they were like some modern mammals. Crocodyles and large flightless birds are better and more plausible models for mesozoic theropod behaviours. See I disagree with this. No the direct evidence of hunting since the chances of that being preserved would be vast. I'm sure they would hunt juveniles, but in the absence of juveniles, what would they hunt then? I think everyone gets an idea in their head and they stick to it. It's sort of the same thing as the T. rex scavenger theory, what does a large predatory animal do when they can't find their preferred prey item/carcass? They go out and try to take something else. Lions will hunt elephants, giraffes and water buffalo, animals much larger than themselves but only if their usual prey isn't around. Killer whales prefer other whale calves, but they will go after adults (blue whales no less!) when they have to. I don't think any large animals is without some sort of predator. In fact the larger the prey gets the larger the predator. This sort of proves my point. If the allosaurs just ate the juveniles then they wouldn't need to get larger. But they did, and so did their relatives. The predator prey relationship is really much more complicated than most people think. Did the bones show sign of cannibalism? I have not heard that. Wouldn't we see some evidence of that like we do at the Cleveland Lloyd site? Doesn't the allosaur trap show multiple sauropods, stegosaurs, ceratosaurs, a Torvosarurus and various other animals? I fail to see how there just being one large theropod at a site, even an apex predator explains away the fact that it's the ONLY animal present. That just isn't how predator traps work. There are always other animals present, that's why this one is odd. Yes, but you would see at least some other animals there. The fact that they are the only animal there is very strange. The Le brae traps show multiple species of predators, not just one. One might be more common than the others but there are still others. So for weeks a rotting carcass in a trap ONLY manages to snag Mapusaurs, nothing else...? 'Coelophysis's, Allosaurus's, Albertosaurus's similar bonebeds are known. But we know that crocs live in groups, not like a pack or anything, but they have a limited hunting area and since they don't need the calories a warm blooded animal does they and all live together in 'relative' harmony. And once again there were other animals in with the Coelophysis. I agree that large flightless birds are a good comparison for some dinosaurs, but they are not apex predators. Hawks and Eagles might be better, but again they can cover large areas, they don't usually take on large prey and they don't live in groups. They have their territories, like modern mammalian predators so why not use mammals for at least a basis of some behavior? I don't think every large theropod lived in packs but finding large groups of just one type of predator seems like evidence to me. I believe Phil Currie also supports this idea. We have that Tenontosaurus site with the multiple Dienonychus specimens. A large prey item and a 'pack' of predators. That's direct evidence of a theropod attacking an adult animal. If they only took juveniles this wouldn't have happened. As for the Albertosaurs, once again many predators and nothing else, many different sizes and ages... Seems like a group to me. What about Sue and the fragments of other T. rexes? And the Daspletosaurs? I'm not saying giant packs, but we have evidence that some theropods lived in packs/ family groups. I think tossing out all the circumstantial evidence in favor of one idea that has no evidence to support isn't any better. The healed broken legs in some theropods is excellent evidence for at least pair bonding, a large two legged animal with one broken leg is not going to be able to hunt, or even go very far to scavenge. I can of course be wrong, but until we find more fossils to either prove or disprove the 'pack' idea, I'll stick to the idea with the most compelling evidence behind it. I’m not saying “I’m right” or “This is the only explanation”, but I want you to consider more interpretations, and not only the (in my opinion) too cited “pack hypothesis”. I’m very skeptical about that idea, because it’s an ethological interpretation VERY difficult to see in a paleontological context, but VERY easy to be seen, regardless of its real evidence. We know that most crocodylians are opportunistic predators. Mapusaurus are... fossil bones. Do you know “a priori” the hunt behaviour of Mapusaurus? What do you mean when you wrote: “the food source is different”? In my hypothesis, the hunting behavior is not relevant in the explanation of the Mapusaurus fossil aggregation. I’m not saying they hunted like crocodyles, I’m only saying that, in environmental stress conditions like those sometime produce a mass mortality among crocodyles, Mapusaurus could aggregate and die together, regardless of being social or part of a pack. These stress condition could be tha same that generate a natural trap, for example a drying river. I remark that there are no direct evidences of carnosaurs hunting adult sauropods: these evidence could be: tooth marks on adult sauropod bones and partial regeneration of the bone (simple evidence of tooth marks could also be interpretated as scavenging). Again, THESE are not mammal populations (where the number of young is very low, compared to adults)! Among dinosaurs, the number of juveniles and subadult is ALWAYS greater than that of adults by at least an order of magnitude. Remember that the eggs sites show that a single sauropod could produce 20-30 eggs, probably every year: assuming a stable population of sauropods, we MUST have a very high juvenile and subadult mortality: almost completely by predation. A subadult brachiosaur / apatosaur / titanosaur was a prey large as a big theropod and more common than an fully adult sauropod: these considerations strongly support the idea that juvenile and subadult sauropods were the favorite prey of theropods. In fact, the giant adult size, and very fast growth were selected by predatory iper-pressure made by theropods on sauropod juveniles. Once a sauropod became a giant adult, theropods avoided to attack it. The asbence of evidence of predation on adults and these simple ecological considerations strongly support the idea that adult sauropods were not part of the theropod food resources. 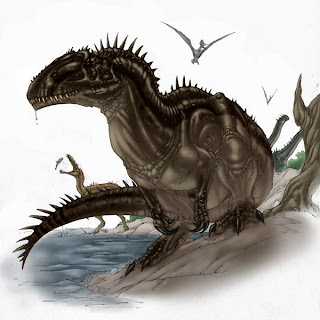 I understand that everyone loves to imagine a pack of allosaurs killing a giant diplodocid, but this is not the most plausible interpretation of the evidences, nor the easiest way a theropod could find food: it was the most dangerous and most rare! The larger the prey, the larger the juveniles and sub-adult a predator could kill. The biggest theropod, like Giganotosaurus, were 7-9 tons. The biggest titanosaurs, living in the same areas, were 60-80 tons. A subadult giant titanosaur, weigthing 10-15 tons, was a more easier and more common prey. Why most people find this simple evidence so difficult to imagine? The La Brea site has many hundreds animals, entrapped in a time span of years or decades. The Mapusaurus site has only 7-9 animals. They cannot be compared. In my scenario, the first animal in the trap is not dead when the second find it, nor the following ones. Remember that I said that if Mapusaurus was the top predator, it was hunted only by other Mapusaurus. Because it is not a good way to explain. If the modern predators were only giant insects, does this legitimate them as good modern analogues for theropods? Most of the behaviour of an animal is mainly influenced by its population dinamic, its reproductive strategy, its internal biology and external morphology (all clearly shared by dinosaurs, birds and crocodyles), not merely by size or “ecological role” (the only vague characters a theropod may share with a modern mammal). Roach & Brinkman, 2007 - A Reevaluation of Cooperative Pack Hunting and Gregariousness in Deinonychus antirrhopus and Other Nonavian Theropod Dinosaurs. Bulletin of the Peabody Museum of Natural History 48(1):103-138. If you want a copy, I have the .pdf of that very interesting study. 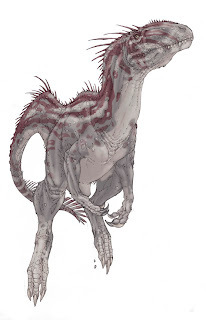 Also, see my post on that topic on Theropoda: March/07/2009. Before I say anything else I did want to give an sort of outsiders opinion on paleontology. It seem like the current new crop of researchers are going to a more concervative view. They make no assuptions without evidence. I agree with this to a certain extant but at the same time they seem to be forgetting/ignoring some basic animal tendencies. For instance most birds pair-bond. But where did they get that from? perhaps their theropod ancestors? That would explain a lot of these 'pack' sites that are not predator trap sites. If the herbivores were grouping together in herds like modern mammals why not the predators? I believe there is evidence for that correct? Don't crows work with coyotes? To clarify the croc food source thing. In general their prey items come to them. They don't have to chase or pursue them. They have a completly differnent hunting stratagey than a large theropod. So why use them when mammals have the same problem? Why not lizards you ask, they are cold blooded and so can actually wait long periods of time for prey to wonder by. Do you see why mammals might be a better choice in some cases? You can use secretary birds if you like but they are not chasing down large prey. Crocs don't seem a very good choice to me. I get that there are other interpretations. But, to me, the most likely idea is that they were a group/pack that died together. Obviously you diagree, that's fine. I don't always agree with what Phil Currie, Robert Bakker or Thomas Holtz have to say. I find the juvenile rexes hunting for adults completely unrealistic. I understand that these are not mammals which is why I mentioned hawks and eagles, dinosaur decendants. I could aso mention veranids. Which only aggrigate under strange circumstances (trapped on small isleand for komodo dragons, and fed by people for water monitors) but since they are far removed from the dinosaur tree I decided not to. I used to have snakes and a few monitor lizards, I know they also hide when not doing well, just like my dogs. So if these animals all follow the same pattern and are so very distantly related maybe this is a common trait? So why in a time of stress/sickness would they all get together and not hide? My wife mentioned a sort fo elephant graveyard senerio. But since there were youngish animals, it doesn't seem likely. It's all speculation of course, but so is a predator trap that only captures one type of predator, or a group getting together around a drying up watering hole. Why not a mating ground hit by a flash flood or toxic gas? It seems less likely given that it would have to have hit at a specific time of year. A family group being hit has a much greater chance of being true. Insects... Interesting... I'll have to admit my knowledge of them is rather limited. But they are only VERY distantly related to tetrapods. That seems a much greater leap than comparing 2 warm blooded tetrapod species. But I do disagree, environment plays as great or greater role than biology. Because the environment shapes that biology. I get that you are of the more conservative ilk, I am not. As I said I don't think every theropod lived in packs, just certain ones. It explains the greater number of allosaurs than say Torvosaurs. I do try to read your blog every few days. But alas the translator is crap (not your fault, they all are, unless it english to spanish or french) so I only get part of what you say. It's really unfortunate because I do actually like and agree with a lot of what you say (at least from what I can understand.) I was a believer in the spinosaur chimera hypothesis. I'm still not 100% sure about that sail but that you wrote was compelling enough to make me question and change my mind. The First pilot episode of the Historiography of the Sloth dinosaurs pt. I - featuring... Giant Sickle-Clawed Turtles from Hell! is currently on "Geomyhtologica"! Hope you'll enjoy the show! I agree with most of your comments: what I wanted to say is: there are more equally plausible interpretations of a fossil site, and the "pack hypothesis" is only one of them, not the only one, nor the best supported by evidences. It has become the "dogma" for theropod fans, although it is very very speculative when analysed rigorously. Dinosaurs are archosaurus, and modern archosaurs (crocodyles and birds) can explain their biology more than other animals. Have you ever used a frog for a good analogue for an extint amphibian mammal as Ambulocetus? Or a modern big flightless bird for understand a saber-toothed tiger? Why we abuse of mammal analogy for interpretate other groups but never do the opposite? Are mammals the solution of every biological question? No, they aren't... but many people believe yes. Thank you for this interesting discussion! I got the PDF thanks! I get the dogma thing, really I do. That's why I said 'most likely' because we can never know for sure. I think it would be a bit strange for all theropods to live in packs. but i do believe some did. Weather we'll ever get any direct evidence is any ones guess. I'm not actually arguing about their biology, but their behavior. 2 very different things. One (thanks to finds like Leonardo and Dakota) we have some good corroborating evidence for and the other we merely have footprints and sometimes a bit more. One we might one day be able to replicate (Horner's 'regression' idea) and the other is lost forever. I completely agree for biology birds and to a lesser extant crocs are the way to go. But for their behavior we have to look at modern animals with similar niches to get at least SOME idea what they might have been doing as we have no birds or crocs that fit the bill (no pun intended.) It will never be exactly right but it can give us some clues. It is to bad the large predatory flightless bird of S. America are gone as I think they would have been a great help but we're stuck with things that fly and are closely related, things that swim and are more distantly related, or things that live on land with similar conditions but are really removed tree of life wise. You favor the first 2, I think the 3rd also will give us information. Until we get more fossils it's really up in the air. I'll go check that out! Feel free to use whatever you need:) And thanks for asking!